Master Financing Agreements are a great financing tool for everyone considering tax-exempt financing and are now available in Indiana. On December 19, 2013, the Indiana Finance Authority (the “IFA”) authorized a turn-key Master Financing Agreement program (the “MFA Program”). MFA Programs are also available in other states and in some cases may be implemented with local government issuers. Nonprofit entities, including hospitals and health care providers, should consider utilizing such a program as a low-cost and efficient alternative to traditional tax-exempt bond financing of ongoing equipment and other capital expenditure needs. Borrowers often refrain from financing routine or relatively small capital equipment purchases via traditional tax-exempt bond financings because of the timing and costs associated with a traditional tax-exempt bond financing. An MFA Program addresses each of these concerns and provides an efficient, low-cost structure for tax-exempt borrowings. An MFA Program provides for financing through a state or local government issuer, such as the IFA, via an approved Master Financing Agreement. The Master Financing Agreement, as the name implies, is a master agreement among a lender, a state or local government issuer and the borrower that provides terms and conditions not only for the initial financing but also accommodates future financings issued pursuant to the program. The Master Financing Agreement establishes the framework for multiple financings and includes general terms, representations, warranties and covenants of the parties. Schedules are added to the Master Financing Agreement with each subsequent financing. The schedules typically include a description of the items to be financed, a reaffirmation by the parties of representations, warranties and covenants contained in the Master Financing Agreement and a payment schedule. In conjunction with the delivery of each schedule, the issuer issues a note to the lender and loans the proceeds of the note to the borrower. The borrower’s obligation to repay the note (documented in the Master Financing Agreement and related schedule) is then assigned to the lender by the issuer to secure the payments due under the note. The result is the issuer functions simply as a conduit for the transaction, just as they do in a customary tax-exempt bond transaction. A chart illustrating the structure of an MFA Program financing is included below. Once a Master Financing Agreement is in place, the cost of subsequent financings via the issuance of schedules to the Master Financing Agreement and the issuance of notes is minimal when compared to a traditional tax-exempt bond issuance, as all parameters for subsequent issuances are set forth in the Master Financing Agreement. 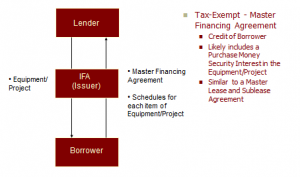 It is important to note that most conduit issuers (state and local government entities) have legal authority to implement a Master Financing Agreement program, whether or not they have officially implemented such a “program.” If your organization has ongoing capital equipment needs and you would otherwise qualify to issue tax-exempt bonds for those needs, you should consider whether implementation of a Master Financing Agreement is a viable and efficient financing option for you.